Ever had the urge to listen to music composed by a shirt or a pillow? Although it might sound strange (pun intended! ), I actually have, and I’m a big fan of the ways that sound and visual art processes can overlap with the help of new technologies. So, I was thrilled to see the surprisingly melodic marriage that resulted from a project called Sound Weaving. 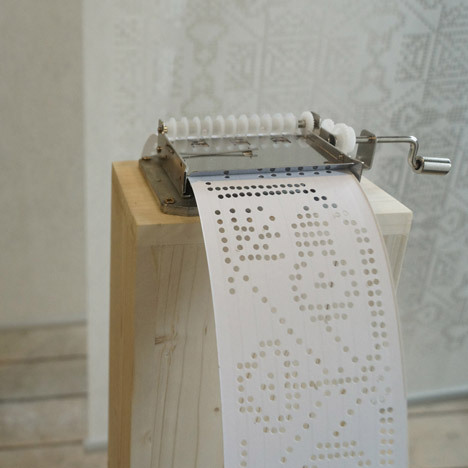 Punch cards may seem very different from embroidery, but both processes rely on compatible programing formats, as Hungarian design student Zsanett Szirmay and Hungarian cimbalom player Bálint Tárkány-Kovács demonstrated by turning traditional Eastern European embroidery patterns into punch cards that play musical compositions when they’re fed through a music box. Although punch cards and traditional embroidery are not new processes, relatively new laser cutter technology was used to cut the punch cards based on the embroidery patterns, which allowed the two processes to come together for a delightful outcome. This project illustrates one of my favorite things about understanding new technologies, which is how they can help us appreciate old technologies in new ways!